At a local greenhouse, they have a type of mum they’ve called “Not So Perfect” which is half the price of the “Perfect” mums. They are just like the “Perfect” mums, except they are smaller, through no fault of the plant. Maybe they weren’t pinched back as they should have been, or were stuck on the end of a row, or didn’t get enough fertilizer and water at key points in their growth cycle. I wouldn’t be afraid to buy some of these “Not So Perfect” mums. Added to a mixed fall planting, no one would notice they were “Not So Perfect”. Or if planted out in the garden, they are just as likely to end up as “Perfect” next year, as “Perfect” is to end up as ”Not So Perfect” next year. 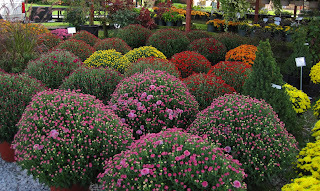 There are plenty of “Perfect” mums for sale there, and they would make for a grand fall display. But really, aren’t you more attracted to the “Not So Perfect” mums? They are the fall equivalent of Charlie Brown's Christmas tree, seeking the right owner, the right gardener, to buy them, care for them, and use them in such a way that no one notices their imperfections. If you are fortunate enough to find some “Not So Perfect” mums for half-price, I recommend you buy a few of them, and then keep shopping at that same greenhouse for other plants because the presence of “Not So Perfect” says a lot about the owner, that she isn’t willing to charge full price for something that isn’t “Perfect”. That’s the kind of person you want to buy your plants from! Perfection can be quite dull indeed. Of course I choose the disfigured warty pumpkin, because it has character. The not so perfect mum is completely adorable. Thank you for the great post! I usually get the ones that fall of the truck and break, bring them home and sort of mass them on the front steps. You would never know looking at it from the street. So instead of collecting stray dogs, you collect stray plants! I'm sure they will show their appreciation with an explosion of color in your fall garden. Yes, those not so perfect mums would fit right in with the rest of my not so perfect garden. I am sure they would give me a shot of perfect color whereever I chose to plant them. Everything I have has imperfections for sure...I could use some of these Mums.. I think most mothers can relate to being "not so perfect mums" I'd buy a bunch for the idea itself and the adorable signage. And of course they'll be more than likely perfect next fall. These "not-so-perfects" look just like the ones Walmart or other stores sell as their mainstay:) They would fit right in with my not-so-perfect garden. I can be a penny-pincher (sometimes) and I would pick these right up and bring them home. Although, that "perfect" mum photo is pretty stunning! That's the kind of price break we need at our nurseries. Once replanted or mixed with other plants, the 'not-so-perfect' hardly shows and actually enhances the other plants by being different. That's what we don't like here, things that are different!-- too different. 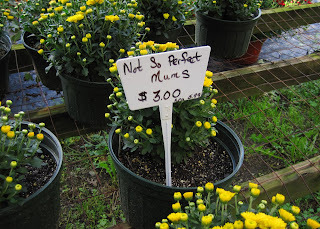 That is a great price on those "Not So Perfect" mums! I'd have to go with those over the others. Where is this "local greenhouse"? I'm not that far from you and I love Mums! Good post about "not so perfect mums." We have a whole section devoted to not so perfect plants. Perennials that are regular 3.99 are 50 cents. Better to make a sale, make a customer happy, and move out plants. Elaine, others in the area, these mums are at Court's Yard and Greenhouse on W. Epler, just across from Adrian Orchard. Lovely, thank you Carol. Adrian Orchard is my favorite orchard in this area, so I will be able to have two treats in one trip! Congratulations on your newest award too. I love your blog and I'm very pleased that so many others do too.